Singapore’s continuous temperature records since 19481 show that the island has warmed, notably in the mid-1970s when rapid urbanisation took place. Mean surface air temperature has risen by an average of 0.25°C per decade between 1948 and today. The upward trend is approximately double the trend in global temperatures, which occurred at a rate of 0.12°C per decade from 1951-2012. The Intergovernmental Panel on Climate Change (IPCC) in their 2013 Fifth Assessment Report state “it is extremely likely that more than half of the observed global trend was caused by anthropogenic (human-activity) increase in greenhouse gas concentrations and other anthropogenic forcings”. The higher trend over Singapore may have been due to the urbanisation, and could also be influenced by regional variations in the man-made global warming effect. Eight of the ten warmest years on record in Singapore have occurred in the 21st century and all the ten warmest years are since 1997. 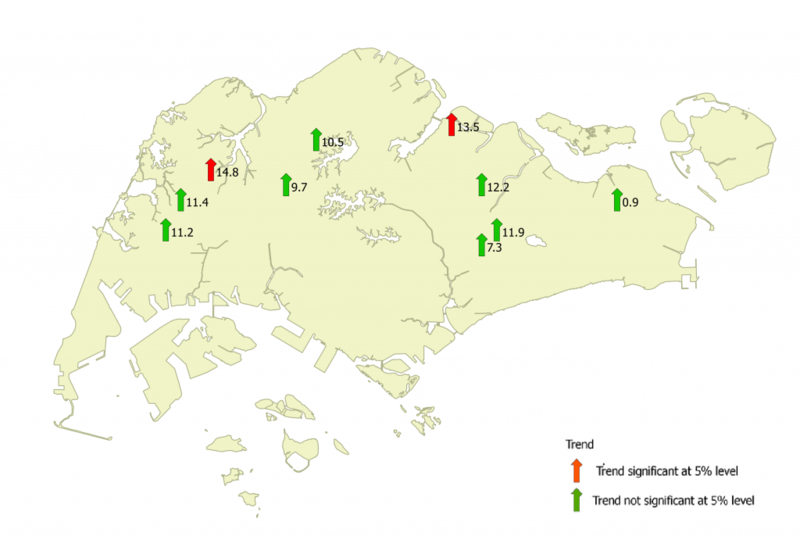 The warming trend brought about changes in the frequency of high and low temperature days across Singapore. Since 1972, Singapore has experienced an increase in warm days and warm nights, and a decrease in cool days and cool nights, as shown in the following table. * Warm and cool days/nights are computed using the methodology recommended by the joint CCI/CLIVAR/jCOMM Expert Team on Climate Change Detection and Indices. Table 2 – Top 10 warmest years based on long-term annual average temperatures records of our climate station from 1948-2018. 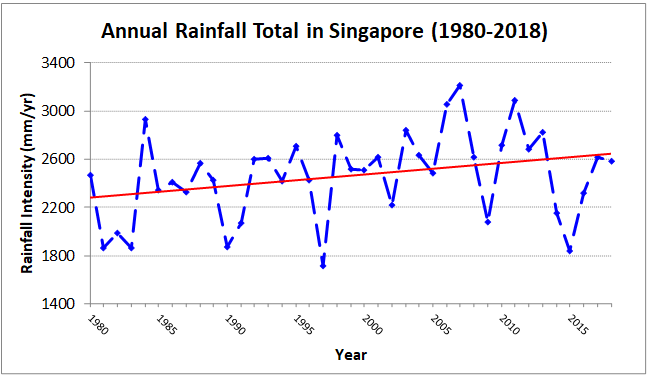 Singapore’s year-to-year rainfall is highly variable; however, on a longer term basis, average annual rainfall total for Singapore since 1980 has increased at an average rate of 100 mm per decade. Fig 3 – Map showing the past trends of annual rainfall total at individual stations. All stations indicate upward trends (up-arrow). 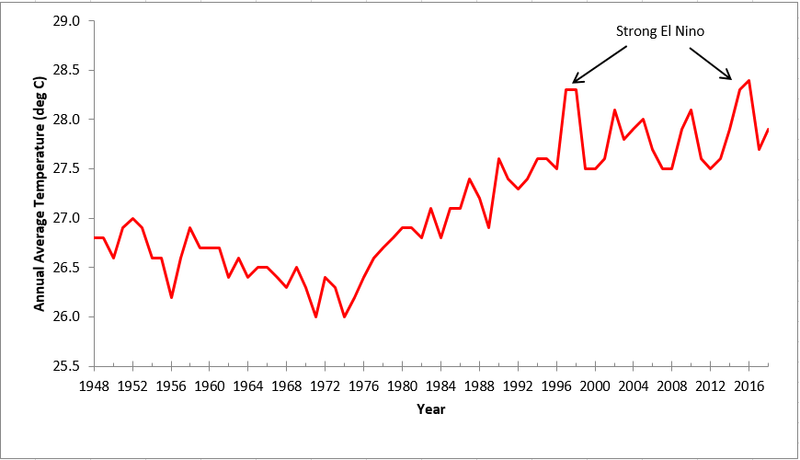 Red arrows represent statistically significant trends.The numerical value next to each arrow indicates the annual rate of change (in mm/year) for the period 1980-2018. In Singapore we have observed upward trends in the average annual rainfall and in the frequency of heavy rainfall over the past few decades. However it is not scientifically possible, using the research information that is currently available, to definitively attribute these observed rainfall changes in Singapore to global warming, natural climate variability or other effects (such as urbanisation). Past climate trends over Singapore have shown an increase in surface air temperatures and the frequency of heavy rainfall over the past few decades. However, the climate system is complex and the past trends and the magnitude of the change will not necessarily continue into the future. Climate projections using tools like climate modelling is thus necessary to project the future climate for planning and adapting to climate change.